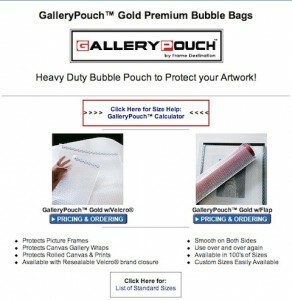 Click above to view a 4 minute overview of the GalleryPouch™ premium bubble bag. In this animation, we show how to adjust the size of any GalleryPouch™ w/ Velcro® Bubble Bag or GalleryPouch™ w/ Velcro® iPad Case. Both are essentially the same product, but the iPad cases are designed to carry and help protect the Apple iPad. CLICK HERE to visit to our GalleryPouch™ w/ Velcro® iPad Case page. 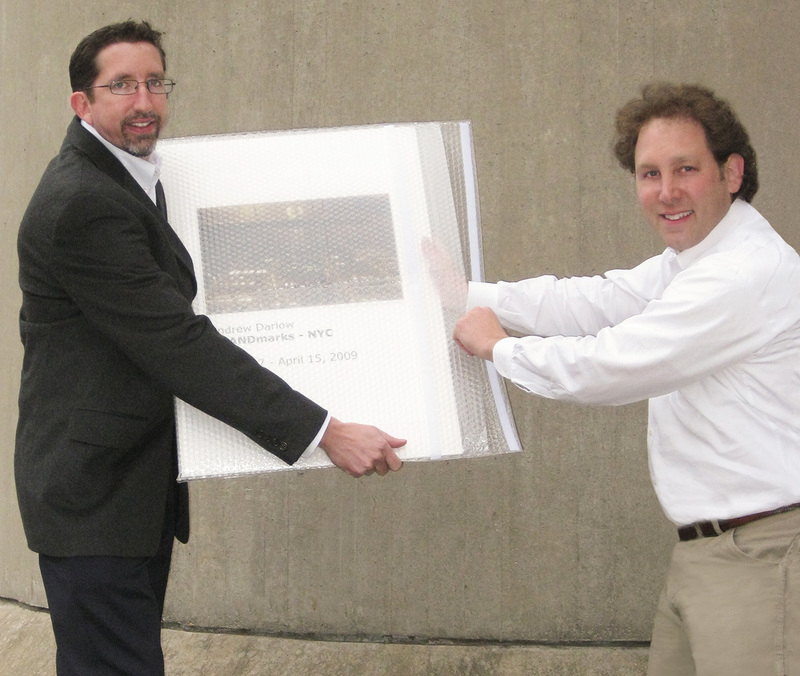 Just over five years ago I proposed a new product to Mark Rogers of Frame Destination, based in Dallas, TX. Fast forward five years, and more than 20,000 custom GalleryPouch™ bags have been produced. I often get compliments on GalleryPouch™ bags from artists and others who use the bags on a consistent basis, for which I’m very grateful. You can read the press release here for the 5 Year Celebration announcement, and for more information or to find the $5 off Gift Certificate code, visit the Frame Destination website at framedestination.com. 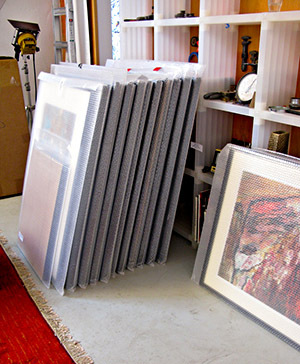 After creating $12,000 in digital and printed gift certificates for an April/May GalleryPouch™ celebration of the 12,000th GalleryPouch™ sold, FrameDestination.com is repeating the giveaway. New and existing customers can take $5 off any GalleryPouch™ bag until 7/31 with coupon code GPSALE5 . GalleryPouch™ w/ Flap does not have a Velcro© -brand closure, and GalleryPouch™ w/ Velcro® – brand closure has both sides of a Velcro® -brand hook and loop attached to the flap so that you can customize the size of the bag as shown above in the animation to the right of the main video. Here’s a link to the page where you can learn more about and/or buy the product. 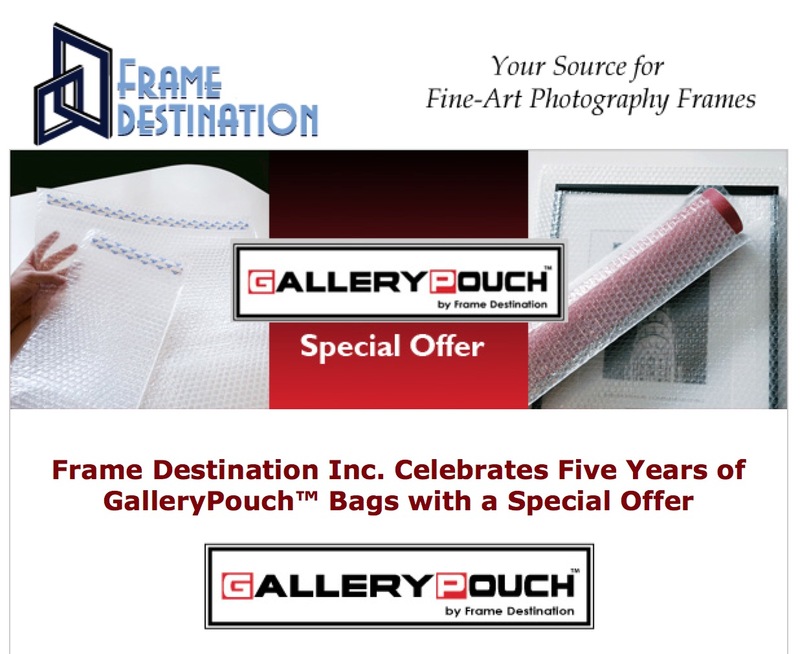 Frame Destination Inc. today announced that it produced and sold 12,000 GalleryPouch™ premium bubble bags since the company launched its GalleryPouch™ line in late 2009. To mark the milestone, the company has made $12,000 in e-gift certificates available for new and existing customers via a special discount code. GalleryPouch™ is available in two options: GalleryPouch™ w/ Velcro®-brand Closure and GalleryPouch™ w/ Flap. GalleryPouch™ w/ Velcro®-brand Closure premium bubble bags have an adjustable self-adhesive Velcro® sealing option. This option allows the customer to custom-tailor the height of the bag. GalleryPouch™ w/ Flap is identical to GalleryPouch™ w/ Velcro®, but does not have a Velcro®-brand closure. Customers can easily seal the bag with packing tape or other fastener. 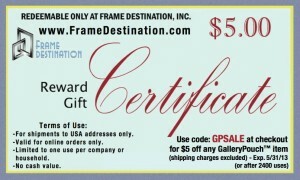 Frame Destination has made $5 e-gift certificates available to new and existing customers in the form of a special discount code that can be redeemed on Frame Destination’s website. The company has made the code valid until 5/31/2013 or after 2400 uses. Thank you Mark for taking time to let us know how you feel about GalleryPouch™ bags! To see Mark Gottlieb’s work, visit his site here.